Summer has finally arrived in London (well, more or less…) so it would have been nice to share a sunny happy picture book this month, but I’m not in the mood… Many things have been annoying me recently: one of my colleagues (of my day job) thinks I don’t work hard enough; my friends take ages to reply to my messages; my ex messages me only when he needs something from me; I’m very excited about our market debut at the House of Illustration illustrators summer fair this weekend with my friends but organising something with totally different personalities isn’t always easy; my flatmate refuses to put kitchen towels back to where they should be; my weight scale seems totally unaware of my hours of efforts in gym; my cat keeps waking me up 4 in the morning every day; and the summer is too hot (and frozen yogurt costs £5 a cup)! I know these things are nothing compared to real problems (refugee crisis, climate change, Trump, Theresa May etc), yet still they make me irritated, if not angry. If adults’ life is full of annoyance, imagine how tough kids’ life can be. It must be really hard as anger is a very powerful emotion to control. I’ve been Princess of Passive Aggressive since I was a child. My mum often said that my mouth often looked like the shape of へ (a Japanese letter ‘he’) and easily stayed that way for hours. Of course I don’t enjoy being Princess PA. I guess neither do you. 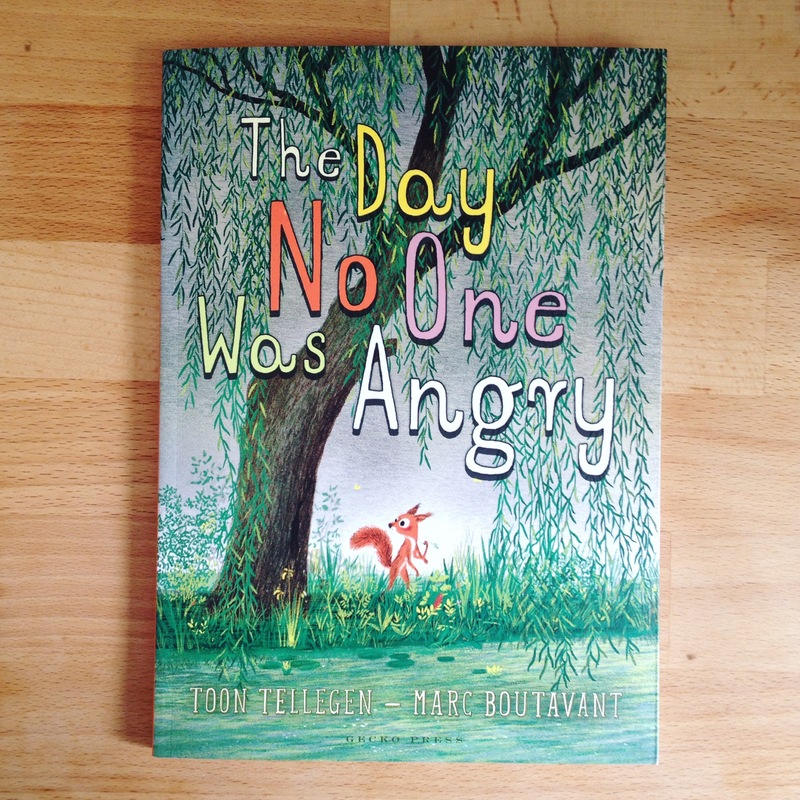 So this month I’m sharing a Dutch children’s book about anger – The Day No One Was Angry by Toon Tellegen and Marc Boutavant (English edition, Gekko Press 2014) to reflect on the emotion. Next moment I took it straight to a till. The book is a collection of 12 funny yet philosophical short stories about pretty grumpy animals. The book reminds me of Rudyard Kipling’s Just So Stories in many ways. In this book, some try to understand their anger, some try to tame it, while others let their anger overwhelm them. My favourites are the lobster the anger salesman and the shrew who tries to make his friend squirrel angry for no apparent reason and fails miserably and makes himself frustrated. All the stories are pretty bizarre (in a brilliant way), but they also have profound tone that stay with you to make you reflect. None of the stories have a perfect closure nor an obvious happy ending, which I think it’s the great thing about this book. I believe that a good story asks questions to make you think instead of giving answers to teach a lesson. And masterful Toon Tellegen has done just that in this book. French illustrator Marc Boutavant’s illustrations here are stunning and perfect companion to the fable-like stories. They have the feel of the 50s picture books by, for example, Kathleen Hale, Tove Jansson and H. A. Rey. His use of limited colour palettes (green, orangey red and yellow) is beautiful and effective. But the real beauty is in the details. A little tiny tilt of a head or an angle of ears make each character come alive and full of unique personalities. Even little tiny characters in the background make you giggle with whimsical details. This short chapter book sits somewhere between picture books and middle-grade chapter books, so I guess it’s suitable for 8-10 year-old. Having said that, this would make a good book to read aloud to younger kids too. Each story offers a gently profound reflection of the nature of human emotions. As on the back of the book, “anger – in all its shapes and sizes – is essential, spirited, and often hilarious”. Regardless you’re a child or a grown-up, if you have a bit of anger management issue, I recommend this book. It will help you see the powerful emotion with a new perspective and understand it better.